It's my first post for Christmas Card Challenges. I'm so happy to be on their design team. This week the challenge is to make a Christmas, Holiday, or Winter card using dry embossing. For this card, I dry embossed this Tim Holtz snowman with an embossing folder and cut him out. Then I covered the snowman in Tim Holtz Clear Rock Candy Stickles to give him more depth and a little sparkle. I used snowflake paper from a DCWV paper pad called Jingle Bells. I colored around the edges with a White Faber Castell Stamper's Big Brush Pen. Finally, I added Goodness Thickers by Amy Tangerine for the sentiment. Be sure to head on over to the Christmas Card Challenges Blog and check out all the inspiration from the other designers. Then, get started early on your holiday cards!! I can't wait to see what you create for this challenge. Oooh, I just love the fun letters, paper and that fabulous snowman. Donna, how cool is your mixed media snowman! Wow, I have save this. I love every inch, including that wonderful sentiment!! 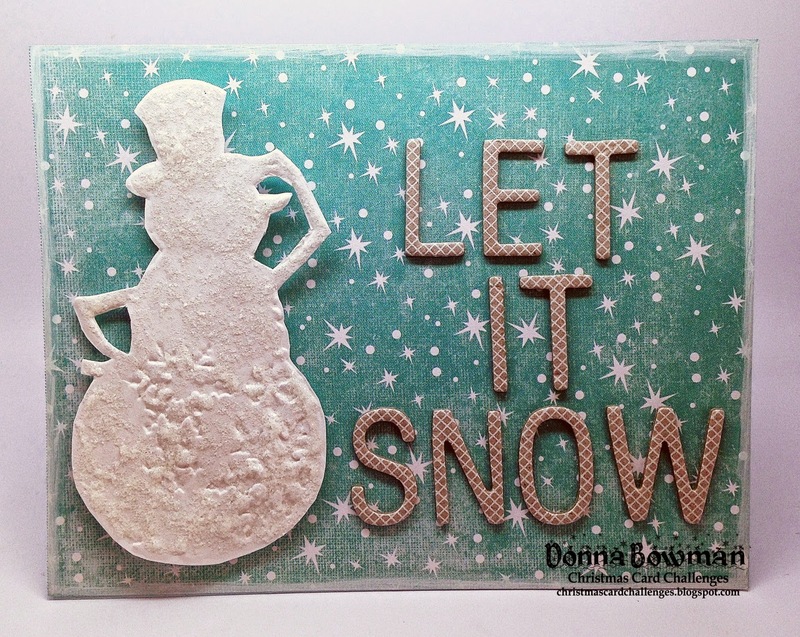 Loving all the texture in this fabulous snowman Donna!